BEIRUT President Bashar Assad's forces pressed on with a military offensive in eastern Damascus on Thursday, bombing rebel-held suburbs where the opposition said a chemical weapons attack the day before killed between 100 and 1,300 people. The government has denied allegations it used chemical weapons in artillery barrages on the area known as eastern Ghouta on Wednesday as "absolutely baseless." The United States, Britain and France have demanded that a team of U.N. experts already in Syria be granted immediate access to investigate the site. After a hastily called meeting on Wednesday, the U.N. Security Council called for a "thorough, impartial and prompt investigation" into the latest allegations of chemical weapons use in the raging conflict. Syrian opposition figures and activists have reported widely varying death tolls from Wednesday's attack, from 136 to as high as 1,300. But even the most conservative tally would make it the deadliest alleged chemical attack in Syria's civil war. The Britain-based Syrian Observatory for Human Rights said it had no word on casualties in the Thursday morning bombing of eastern Ghouta. It said Syrian warplanes conducted several air raids on eastern and western suburbs of Damascus, including three that took place within five minutes. Assad's government acknowledged on Wednesday the ongoing military offensive in Ghouta, but denied any chemical weapons were being used. Regardless of the myriad calls for the U.N. inspection team to examine evidence in Ghouta, the inspectors need permission from Damascus to enter the area first. With the military publicly carrying out an offensive against what it says are "jihadists" based in the area -- a term frequently used by the regime to describe all rebel forces in the country -- the government could deny the UN team access on security grounds. Wednesday's alleged chemical weapons attack left scores of children dead, their lifeless bodies appearing in amateur videos wrapped in white cloths, their pale skin unmarked by any wounds. French Foreign Minister Laurent Fabius raised the possibility Thursday of the use of force in Syria if it is proven that Assad's regime used chemical weapons in Ghouta. Fabius said if the allegations are proven, "we need a reaction by the international community .... a reaction of (military) force." He excluded boots on the ground as an option, "but a reaction that can take a form, I don't want to be more precise, of force." UNICEF said in a statement that the reports of attacks on civilians, presumably including children, were "deeply disturbing." "Such horrific acts should be a reminder to all the parties and all who have influence on them that this terrible conflict has gone on far too long and children have suffered more than enough," UNICEF said. "Children must be protected, and those who fail to protect them will be held accountable." Mohammed Abdullah, an activist in the suburb of Saqba told The Associated Press via Skype that most of the dead were buried the same day in mass graves in different areas in eastern Ghouta. He said the burials took place quickly for fear the bodies might decompose as a result of the heat and lack of electricity. He said relatives identified some of their dead family members before burial while unidentified victims were photographed and their graves tagged with a number in case their loved ones come to collect their bodies in the future. "Most of the dead were buried in mass graves," Abdullah said. 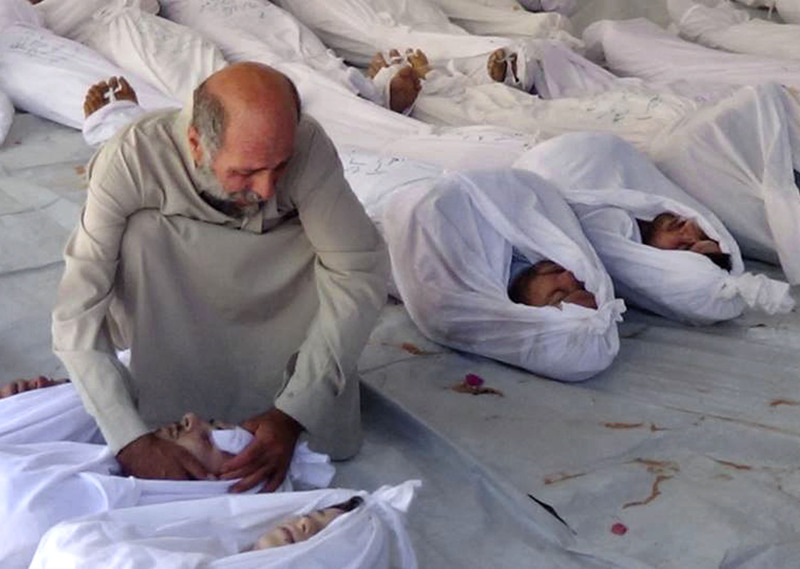 The unrest in Syria began in March 2011 and later exploded into a civil war. More than 100,000 people have been killed in the conflict so far, according to U.N. figures.